A police officer in Rock County, Wisconsin, is going above and beyond her oath to protect and serve by donating her kidney to an 8-year-old boy who she’s just met. 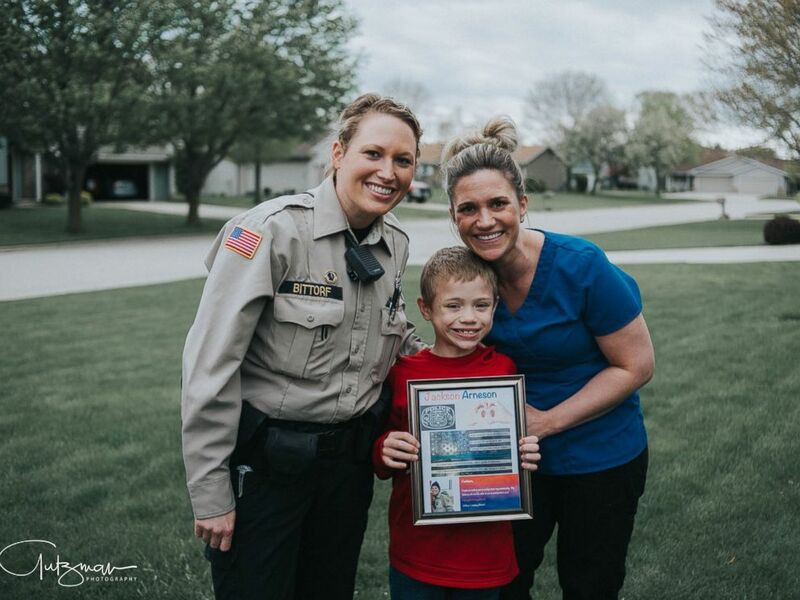 Officer Lindsey Bittorf of the Milton Police Department was browsing Facebook in early December when she came across a post by a mother in Janesville, Wisconsin, who had made a public plea for potential kidney donors for her 8-year-old son, Jackson Arneson. Bittorf didn’t know the family, but she was moved by the mother’s post. Jackson was born with a kidney condition called Posterior Urethral Valves, and his family always knew that one day he would need a transplant. After years of testing determined that family and friends weren’t a match, his mother, Kristi Goll, turned to social media. Goll shared a photo of her little boy, saying that recent lab results showed his kidney function is still decreasing and he’s in need of a new kidney, preferably from a living donor. Her Facebook post was shared nearly 1,500 times. For a successful kidney transplant, the donor must be in good health, their blood type must be compatible with the recipient and both people involved need to match a certain number of antigens. After seeing Goll’s Facebook post, Bittorf was compelled to get tested to see if she was a match. “I’m pretty set in my ways, so if I set my mind to something, there’s really not talking me out of doing this. I was doing it,” Bittorf told ABC News affiliate WISN. The police officer passed the initial health test, finding that she shared the same blood type as Jackson and they matched three antigens – more than enough to proceed with a kidney transplant. At 30, she’s also within the appropriate age range and in general good health. Bittorf said doctors were “shocked” that a complete stranger was such a good match for Jackson. “We hugged a lot and we cried a lot, and it was just a pretty amazing moment,” Goll said in an interview with WISN, wiping away tears. Jackson and Bittorf are scheduled for transplant surgery on June 22.